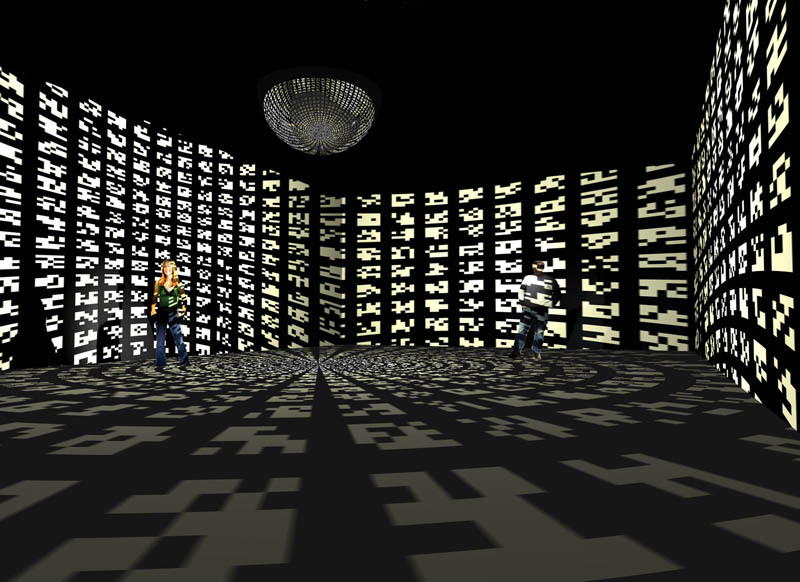 during the TRANSMEDIALE 2010 TECHNOLOGY MUSEUM BERLIN .. The pictogram_generator based on a software program (HLX and JVSchmidt), that text information transformes into a matrix of luminous elements, into characters, structures, "images". The "Word of the Day" ... .... from the Internet, which are filtered out of current daily news, form, over a specific period collected, the basic material for the transformation into the visual. They are transfomed into 400 pictograms arranged in a 20 x 20 matrix and, due to the superposition of different lighting times, change their appearance permanently. The pictograms are reflekted on the surface of a spherical mirror and are spreaded into the surrounding space.The viewers in the room become projecting surfaces and are amidst an universe of emerging and vanishing "Signs of the Times". The pictogram_generator allows associative access to information, that with rational means can be detected only incomplete. This parallel walk in association areas could be a promising approach in control of information overload.